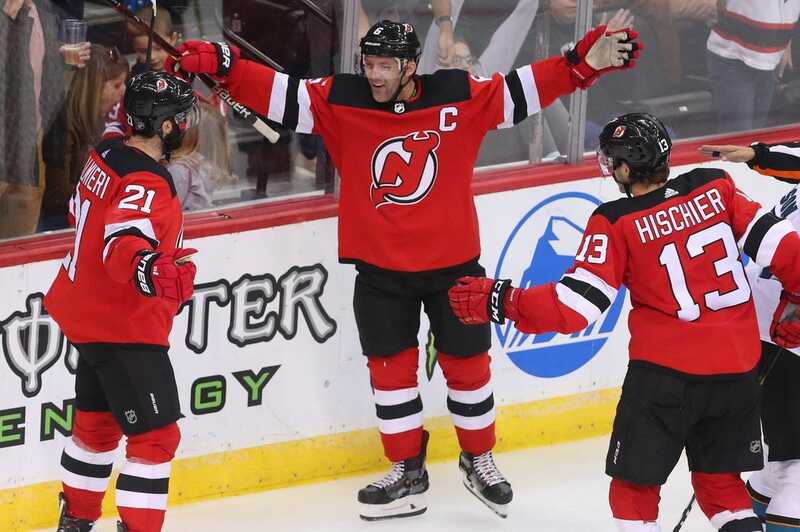 Kyle Palmieri recorded his third consecutive two-goal game, Keith Kinkaid made seven crucial saves during a late power play, and the New Jersey Devils held on for a 3-2 victory over the San Jose Sharks on Sunday in Newark, N.J.
Palmieri became the fourth player in NHL history to score multiple goals in at least three straight games to start a season, joining Patrick Marleau (2012-13), Peter Stastny (1982-83) and Cy Denneny (1917-18). He scored on a five-on-three in the second period and added a goal in the first minute of the third. Jean-Sebastien Dea got the game-winner shortly after Palmieri's second goal, and Kinkaid did the rest, finishing with 37 saves. Joe Pavelski and Timo Meier scored the goals for the Sharks. Andrew Cogliano scored a power-play goal with 5:16 remaining to break a tie, and Ryan Miller had 29 saves to lead Anaheim to a victory at St. Louis. Cogliano swatted in a centering pass by Ryan Kesler from the left corner past St. Louis goaltender Chad Johnson's stick side for his first goal of the season. It was his 100th goal as a member of the Ducks. Jakob Silfverberg and Ben Street also scored goals for Anaheim. Miller got the win in his first start of the season. Alexander Steen and Tyler Bozak scored for the Blues. Bryan Little scored with 2:09 remaining to break a tie as host Winnipeg dealt Carolina its first regulation loss of the season. Josh Morrissey assisted on the winning goal, which was Little's first goal of the season. Kyle Connor added an empty-net goal with one second remaining. The outcome increased Winnipeg's home-ice winning streak to 11 games, a stretch that extends to last season. All the game's scoring came in the third period. Patrik Laine scored Winnipeg's first goal. Micheal Ferland responded for the Hurricanes. Winnipeg goalie Laurent Brossoit, making his season debut, recorded 42 saves. Hurricanes goalie Petr Mrazek stopped 23 shots.